The UASA Secretariat announces the issuance of the 20th edition of the quarterly newsletter "Union News". The newsletter covers the latest developments and events and news related to the Arab and the international capital markets. 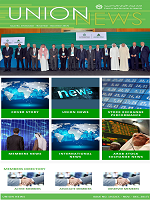 It also covers, the Arab Stock Exchanges news during the first quarter of 2018.